This page is dedicated to where to meet, what flights to book, what to bring, and details about money on the 7-day Hokkaido Snow Tow. You will be meeting the group at Sapporo's Chitose Airport (CTS) at 2pm. If you're arriving in the domestic terminal (which you will be unless your flight arrives directly to CTS without stopping in Tokyo or Kansai first), walk to Domestic Arrivals Gate 2 which is adjacent to the Mos Burger. If arriving in the international terminal (rare unless arriving from Asia), walk over to the domestic terminal, head down to the first floor and walk to Domestic Arrivals Gate 2. You will need to book your international flights to/from Sapporo's CTS Airport. You need to be at CTS in time to be at the meeting point by 2pm. If you can't make it to the meeting point by 2pm, you'll need to arrive before day 1 and arrange your own accommodation. If arriving before day 1 and staying in Sapporo, just take the train out to CTS to meet us at our meeting point by 2pm. CTS airport is a short 30 minute train ride from Sapporo Station. Sapporo is a really great city with lots to do so it'll be worth it to spend a night here! If you're interested in saving a bit of money, you can usually get a cheaper ticket to CTS (Sapporo) if you book it separately from your international round trip. For example, get your international round trip to Tokyo's NRT airport, then book a separate flight on a Low Cost Carrier such as Jetstar Japan, Peach, or Vanilla Air. A few options at the end of the trip; you can get dropped off at CTS airport, Sapporo Station, or Sapporo's Teine Ski Resort on the final day of the trip. CTS drop off: we'll arrive at CTS by 11am on the final day of the trip. When considering your flight back, you should plan on getting a flight no earlier than 1pm in case there are any delays. 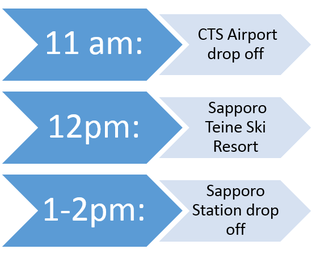 Sapporo Teine Ski Resort drop off: If you want to get a half day of skiing in, you can opt to get dropped off at Sapporo Teine Ski Resort on the final day of your trip (lift tickets not included). We'll drop you off there, but note that you'll be on your own for transportation from Teine to your next destination. There are buses that run hourly from Sapporo Teine to Teine Station, a 10 minute train ride to Sapporo Station. Sapporo Station drop off: we can also drop you off at Sapporo Station. We usually arrive at Sapporo Station between 1-2pm. ﻿Looking at the What's Included page is a good starting point to get an idea of what you'll need to spend money on. Other then that, the amount of money you spend in Japan largely depends on your preferences. Do you want to eat sushi every day? Are you going for the most expensive sake? Will you be buying lots of souvenirs or electronics? Below is a cost estimate based on how much is spent daily on each item. 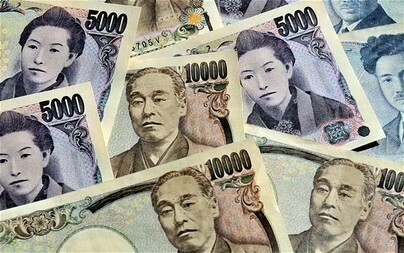 Prices are in JPY. Over the 7-day trip, you can expect to spend ¥46,400 on the low end or ¥91,700 on the high end. Keep in mind that results will vary depending on your personal spending.